So after finishing Paris marathon in a new PB of 3:28:05, I was looking forward to getting back out and doing another Marathon – I guess it’s good that I actually look forward to this, as I’ve still got another one to do! I’ve had this past week following Paris off work (except for a couple of days at college for study) as it was mine and my wife’s birthdays. We enjoyed a spa day on Friday to relax, recover and chill out some more. Training wise I did a 1500m swim (bit of practice before a triathlon in May), and Dulwich parkrun on Saturday to celebrate it’s first birthday. We travelled down to Brighton on Saturday, as with another expo and early start it was the best option. At the expo I chatted with Dave @compressport who was friendly at VLM last year when I first met him, and picked up a new pair of Trail Compression shorts. I use their socks to run with and F-legs for post run recovery, but also have the ForQuads, which I haven’t got on with running wise. I find they slip down, and I lose too much time having to pull them up. But they work really well under a tri suit or cycling shorts. When chatting to Dave we think it might be because of my hairy legs and the silicon not gripping. So to get round this I am giving the new trail shorts a go. First impressions are that they offer very good compression of the quads and hamstrings, during today’s run I never got a feeling like my hamstring would cramp (I did feel like it might go in Paris, so kept to a pace which didn’t risk it). With the forecast for Brighton being a scorcher but with a strong southerly breeze, it was difficult to gauge what impact this might have. Following running Paris at an average of 4:56/km I set my Garmin to 4:55/km. Given the course up to 15km is undulating, with hindsight, I feel that this was too optimistic. Even though I felt fresh at half marathon (1:43:43), 1 minute up on target. The extra effort at the start might have influenced my finish. Getting back on the sea front, the wind didn’t seem to be having too much impact, and was acting as a nice cooling breeze. Heading up to the out and back loop in Hove I decided to do a watch reset to wipe the 1 minute gained so far and just settle into a 4:55/km pace and bank the minute and get through the next 10km or so at a steady pace. This bit of the course is one of the mentally challenging sections. There is a slight up hill to the turn around, and is through a residential area so no sights to aim for. I can’t really fathom what happened next, I think recording a > 5minute km and starting to feel a bit of stomach pain from the gels made me walk a small section. But walking is a marathon runners nemesis. Psychologically, when I know I am going to miss my target time then re-starting, plus knowing there is still about 30 minutes to race – I give up. I also think I under estimated what impact having a marathon from last weekend still in my legs would have. The last 6km took was a mix of run/walk. The crowd really push you on, and give a little cheer if you start re-running in response to their shouts. But when you get out of their sight it is all too easy to walk again. 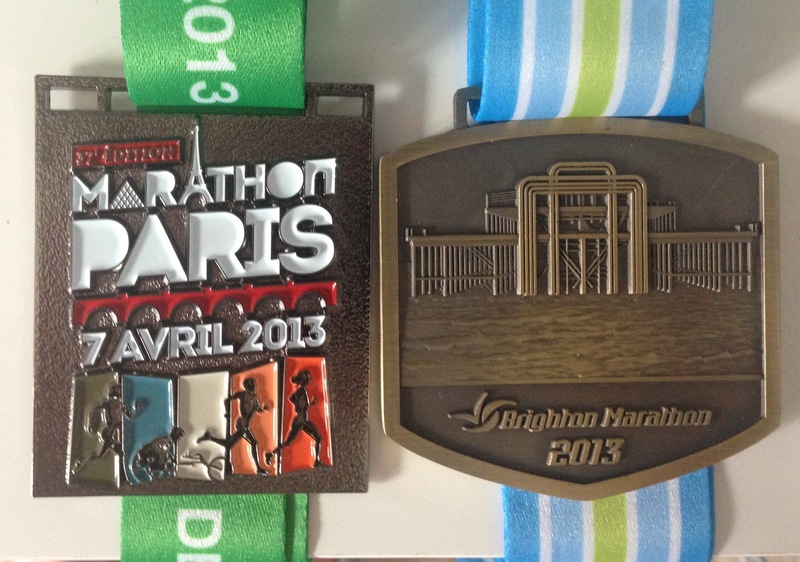 During one of my walking stints I noticed another runner with Paris-Brighton-London on the back of their vests. I just had to catch them up to meet someone who has probably had their friends call them mad, just like mine have! Crossing the finish line was a relief and putting it all into perspective a 3:38:33 is still an amazing time, off the back of a PB last weekend, and is my 3rd fastest marathon time. After crossing the line, you end up having to walk past all the baggage lorries which in Paris they let you exit before. This walk seemed to go on forever. NACC one of the charities I am supporting had a tent on the beach, and it was good to meet the team and have a well earned sit down. So far between my own page and my shared work fundraising page I have raised over £700, so thank you once again to those who have sponsored me. So with one marathon to go, I’m going to have a bit of a different recovery. Lots of pasta to refuel properly, and sitting at my desk as I’m back to work (this isn’t good for recovery). I will also try and do some swims and ride to work. I am looking forward to London next week and will try to get back under 3:30 and add to this medal collection. After getting home from the race it was sad to hear the tragic news of a fellow runner in the marathon today. It always puts life in to perspective, and to make the most of each day. RIP. 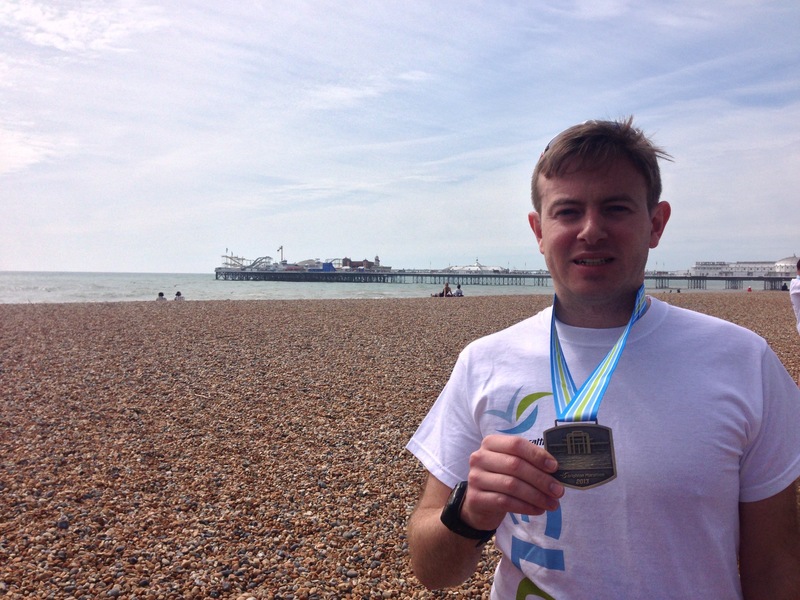 This entry was posted in races and tagged 3marathons3weekends, Brighton Marathon. Bookmark the permalink.